Eddy Daemon is in thrall to Shake-Speares Sonnets. The subtitle says so. It also says this new book is a posthuman homage to said sonnets. I have no idea why the apostrophe is missing, or how Harris has let the daemon loose within these 14-line texts, but let loose he has, in a wild rollercoaster ride of cut-up, collage, image overload, scientific [dis]information and post-apocalyptic textual dystopia. Harris’ world is a posthuman one of decay, ruin, sensuality, intellectual and sexual abandon. Eddy Daemon, our anti-hero, runs amok through it, never pausing for breath, preferring to pile on the adjectives, the verbs and the images, choosing to live only in confusion. ‘He won’t be radicalized with selective memory.’ Why? Because he appears to remember everything except his source material. Where is Shakespeare in all this? ‘Eddy perfects the idea of degraded origin’, apparently through ‘divine breathing-in’ and ‘rapture’s canon’, with ‘lust awakened’. ‘Future resistances will be quaint.’ This is a poetry of radical desire where ‘[d]ecorum is tossed out’, a poetry that is ‘certainly not the punctured balloon of drudgery’. Language here is alive and pulsating, ultra-alive as Harris sends electric and electro shockwaves of ideas into his paratactical texts. ‘We’re in the database and have legacy’, we’re condemned to chaos, to undoing creation and reassembling sense and syntax. Better enjoy it while we can. Why? Perhaps because ‘we must in complexity’s gut-lacing closure’. Rupert Loydell is in thrall, it seems, to Eddy Daemon. 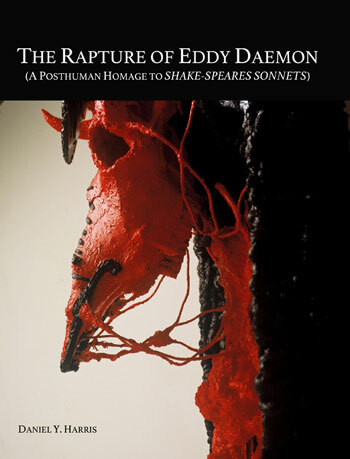 In his new pamphlet, Inner Space Ghost Machine, he offers up the title sequence documenting ‘the afterlife of Eddy Daemon’ as well as a sonnet remix afterlife, where the original is mashed and mangled beyond repair, compressed into a ‘nonsensical arc of emotion’, a whirl of lexical disruption and cantilevered excess. The 16 poems of ‘Inner Space Ghost Machine’ are more straightforward. Accompanied by simple yet effective line drawings by A.C. Evans, we start with Eddy Daemon swaggering ‘Out of the great plethora of stories about stories’. Loydell, it seems, cannot be bothered to invent his own characters, instead has simply appropriated Harris’s and placed him elsewhere. Here, elsewhere seems to mean space, as our hero witnesses a ‘Star Command fly by’, walks through the city of lights, and gigs with his band at the end of the world. Eddy, we are told, ‘is set to a repeat cycle’, so I look forward to further psychic disruption and overloaded hyperglitch from Harris and Loydell, and their lively and entertaining anti-hero Eddy Daemon. Hurrah for dameonology and daemonics. ‘The edge of the world has gone missing’ but who cares? Eddy Daemon is holding a party in the movie of my dreams. This entry was posted on 20 October, 2016 in homepage and tagged Daniel Y Harris, Inner Space Ghost Machin, Johnny Brainstorm, Rupert M Loydell, The Rapture of Eddy Daemon. Bookmark the permalink.